To launch the fall season and to celebrate the cattle industry in the South Platte Valley, come join us and bring your friends and/or business colleagues and experience a bit of the old west. This is the second annual Goodnight Trail Chuck Wagon Dinner. There will be a chuck wagon dinner of steak, cowboy beans, trail potatoes and peach cobbler (don’t let Cookie see you tasting that cobbler first). This will be limited to 100 guests. There will be a $40 donation per adult. Children 14 and under will be half-price. In addition to the dinner, a music program of traditional American and western songs will be provided by Robin JoLeady and her accompanying musicians. Robin has been awarded Colorado Country Music Association's (CCMA) Female Vocalist of the Year. 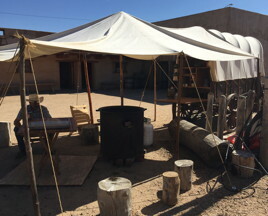 In addition to the music program there will be a display and interactive areas of a Native American tepee, a cowboy’s roundup camp and a range line cabin. 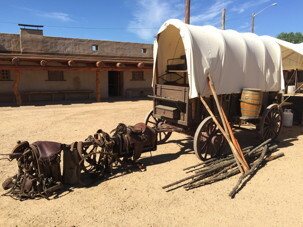 There will be demonstrations of cowboy skills, such as roping, and presentations on the tools of the cowboy -- his saddle outfit, bedroll, branding irons and typical weapons. Opportunities will exist for guests to try their hand at being a cowboy by using a branding iron to make a takeaway brand souviner. A roping steer will allow you to try your hand at roping a calf. Western themed door prizes will be drawn for, so keep your ticket stubs. Dinner will be served starting at 5:30, but demonstration events will begin at 4:30. Come out an get a taste of the old west from the cattle trail days.